Every nation has its favourite condiment to use with French fries. The British use vinegar and the Americans ketchup, but the favoured condiment in Iceland is cocktail sauce. This versatile pink goo is also good with deep-fried or broiled chicken, hot dogs, grilled sausages and fried fish. I have watched in amusement as Icelanders abroad tried to make cocktail sauce from salad cream and ketchup because they could not imagine eating fries without it. Take 200 gr. sour cream or 100 gr. sour cream and 100 gr. mayonnaise and stir until smooth. If you are using both mayo and cream, stir separately and then mix. This is important and will help you avoid lumps in the sauce. Add approx. 3 tbs ketchup. Finally, add 1/2-1 tsp sweet mustard. You can make cocktail sauce in a blender, in which case you just dump everything in at once and mix on high until smooth. 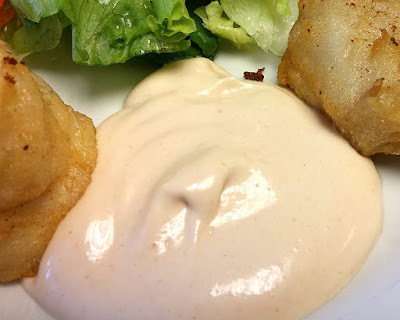 -For simple cocktail sauce, use mayonnaise and add enough ketchup to turn it pink. Add a bit of cream to make it smoother. -Try it in seafood/shrimp cocktail in place of seafood cocktail sauce. -When using with fish, I usually mix in a little garlic to add bite to the sauce. Use either powdered or fresh garlic (finely chopped or crushed). -To make my special hamburger sauce, make as above, using 50/50 mayo and sour cream or just light mayo. Add some finely chopped chives or mixed herbs. If the sauce seems too thick, thin with cream or milk. My mom used culture milk (ice: súrmjólk) instead of mayo, surprised you didn't have that variant here. You can also use pure yogurt (greek is great) instead of sour cream, and even add a dash of Worcestershire or sweet mustard without ruining the basic concept.